Figure 6-8. Tracking and Data Relay Satellite TDRSS, which would be inserted into a geosyn chronous orbit, was equipped with three-axis stabilization and monopropellant hydrazine thrusters. Its power was realized from two solar arrays (3.94 x 3.62 m) with NICd battery storage. 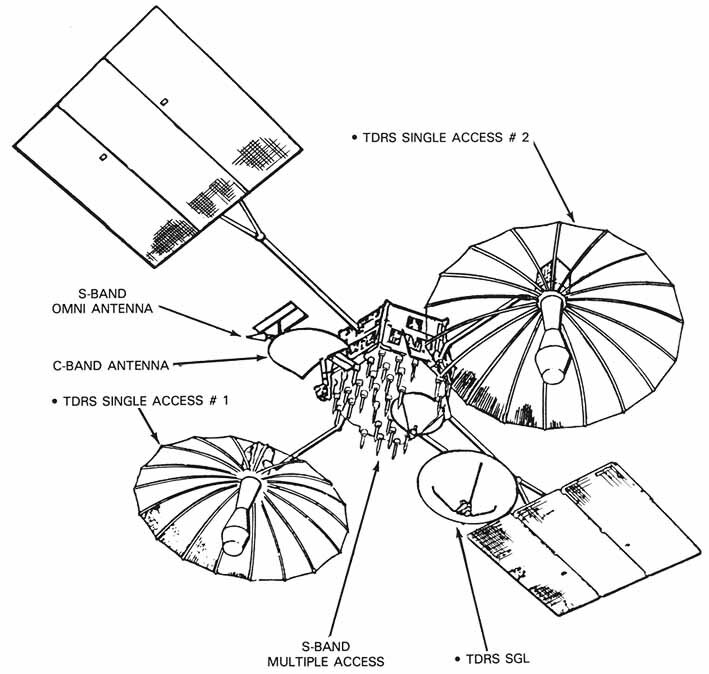 The 198 000-kg satellite had a hexagonal main body (2.4 x 1.27 m) and was equipped with two dual frequency S-band and K-band steerable 4.9-meter antennas, one C-band 1.47-meter fixed antenna, and one K-band space-ground link steerable 2-meter antenna. It had one 20-user S-band multiple access return channel and one time-shared S-band multiple access forwarding channel. The satellites were to last 5 to 10 years.